Instagram is one of our favourite hunting ground for finding awesome new/old artists in & around the Designer Toy universe. On our merry scrolling through, we scrolled by a UK graphic designer, Rob Wellings, that is stepping into Designer Toy world with his latest marketing figure. Meet RoBit! What we love about RoBit is the cleanliness of the design. Nice & simple but effective in its cuteness. 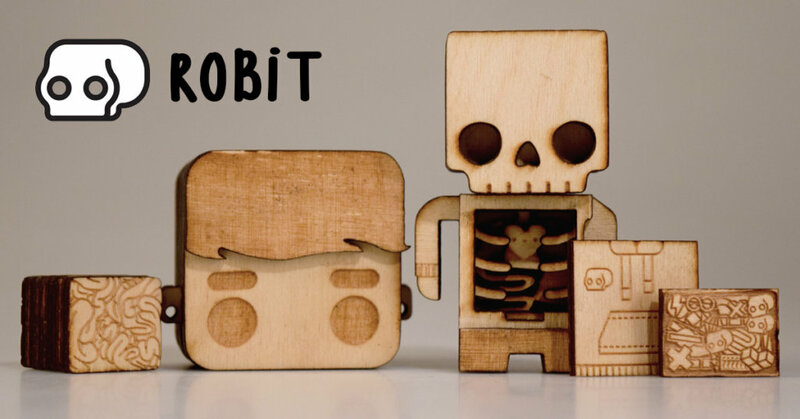 Handcrafted/lasercut from wood, we could easily imagine RoBit in vinyl form too. Rob plans to send these out as promotion products to kickstart his career in design. We have absolutely no doubt these will catch the eye of those in the business and we wish Rob every luck in the world. We love how he’s put together a definitive guide on how to pull your RoBit to pieces. Whilst Rob is not currently selling RoBit, you can still go check out his artwork on Instagram HERE. We are really liking Rob’s style! I am interest your photos.How to connet you?